Approximately 80 million Americans play poker and 50% of them play non-internet poker recreationally. The first online poker room ever was Planet Poker (1998) and the second was Paradise Poker (1999). In January 2004, online poker revenues stood at around $40 million per month, and were growing by 27% per month. At peak times over a million people are playing for real or play money at the various card-rooms around the world. Party Gaming is worth about $8.3 billion, according to calculations based on the company's 2004 net income of $350.1 million. Party poker is today the number one online poker room with more than 2 million members and over 100.000 players playing at peak times. Kathy Liebert won the first Party Poker million tournament and won $1,000,000. Phil Hellmuth (24), the youngest player ever to win the WSOP main event, had his head shaved after wrongly predicting the outcome of a WSOP event. Chris Moneymaker (won the 2003 WSOP main event championship) sold 20% of his entry to his father and 20% to his friend to finance his trip to Vegas for the 2003 WSOP. Johnny Moss is the only person declared WSOP Champion without actually winning the event. You win most of your poker money from putting your opponents in a position to make big mistakes and not from your own brilliant play. 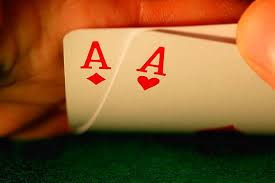 There are 2,598,960 possible poker hands with 52 cards. The four suits, hearts, diamonds, spades and clubs originated in France in 1480. Spades represent nobility, Diamonds represent merchants, Clubs represent peasants and Hearts the clergy. High-quality plastic cards last much longer than the paper ones and the casinos normally change decks after 15 minutes of steady play. There are two "one-eyed" Jacks in a deck of cards. Jack of spades and Jack of hearts. 70 million decks of cards are sold in America each year. Johnny Chan keeps an orange at the poker table to have something to smell if players start smoking. H.O.R.S.E. is a form of poker usually played at the high stakes tables. It consists of rounds of play changing among Texas Holdem, Omaha, Razz, Seven Card Stud and Seven Card Stud Eight or Better. blog soоn. Аnywаys, if you have any ѕuggeѕtions or techniques foг new blog owneгs please sharе. ѕimply wanted tο ask. Cheeгs!